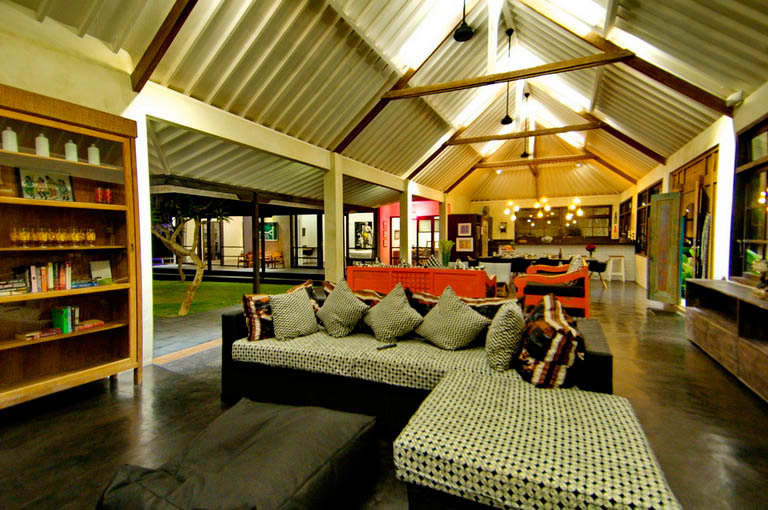 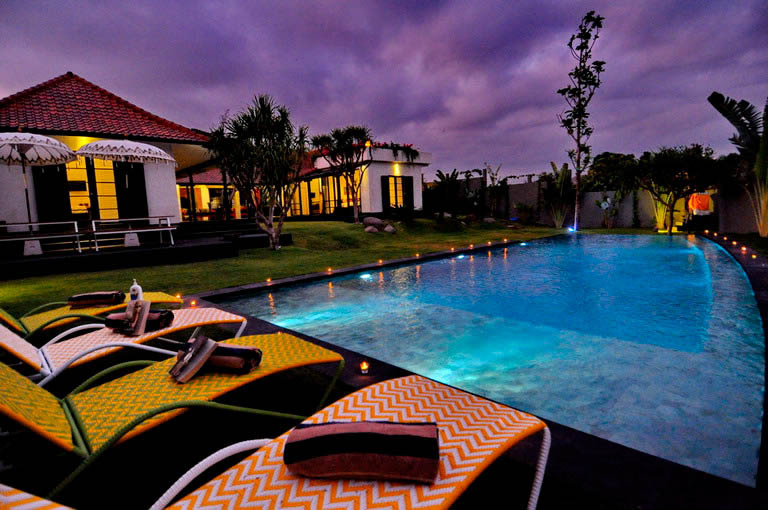 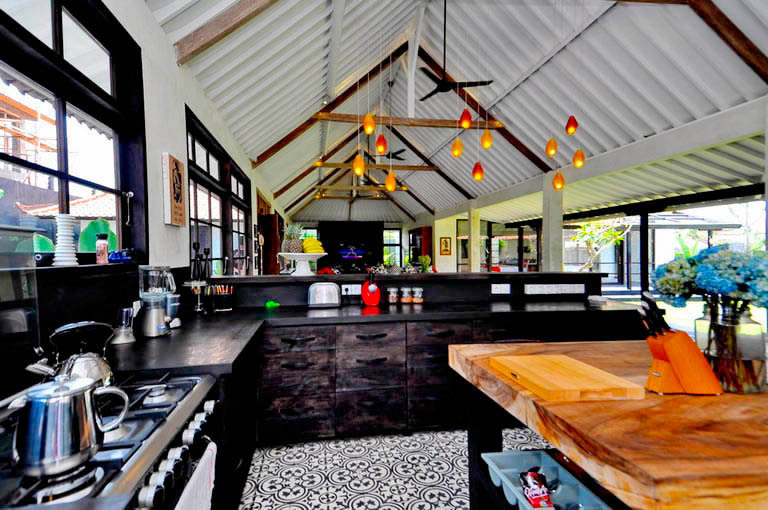 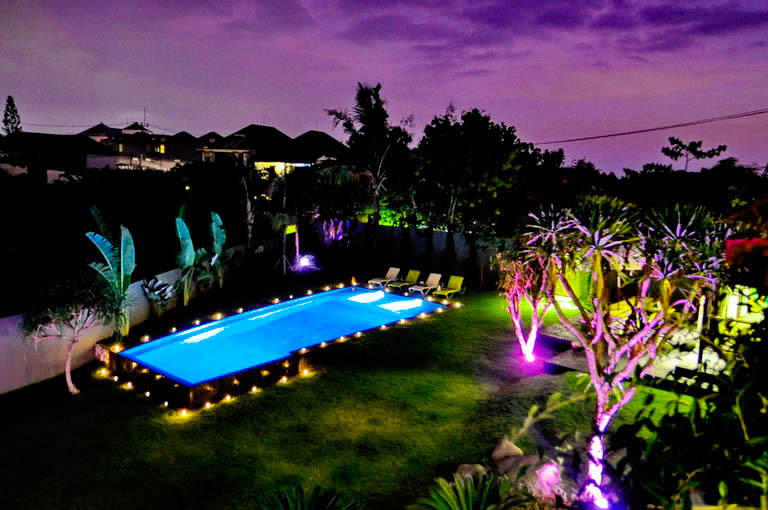 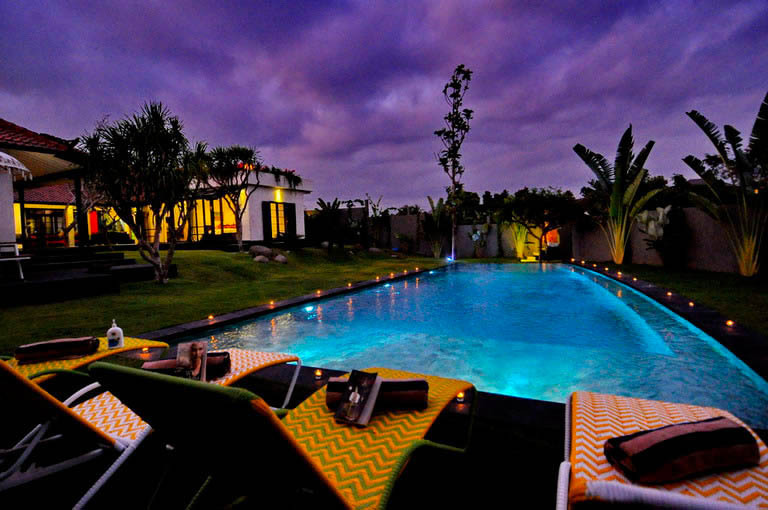 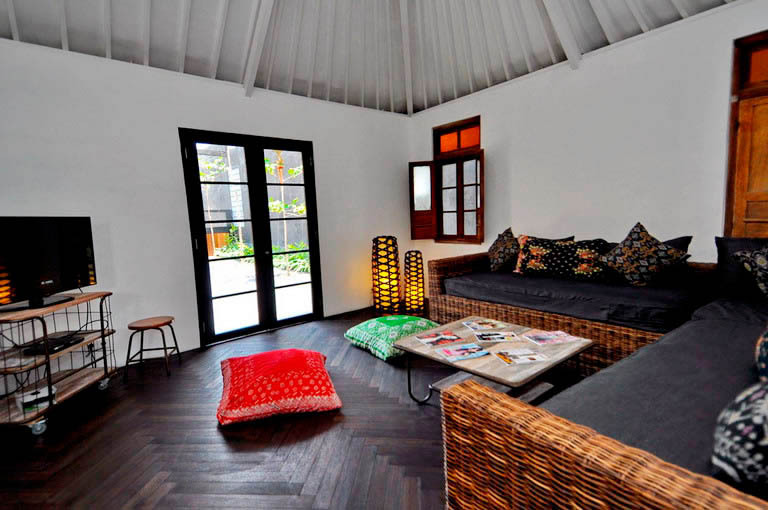 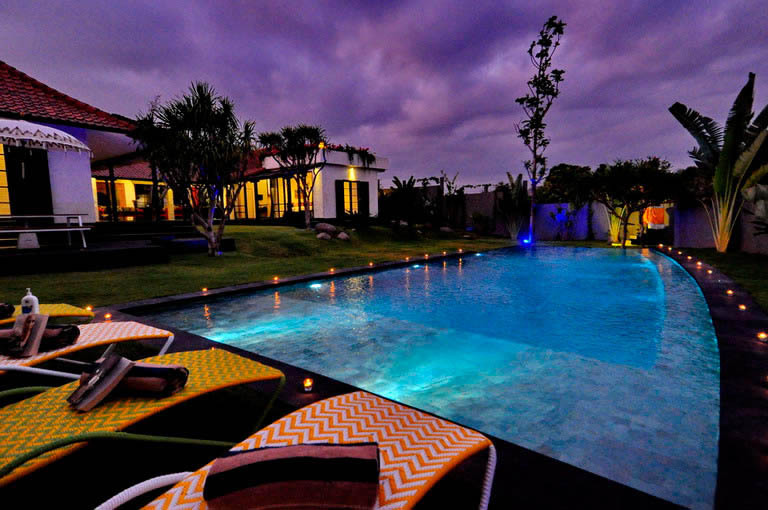 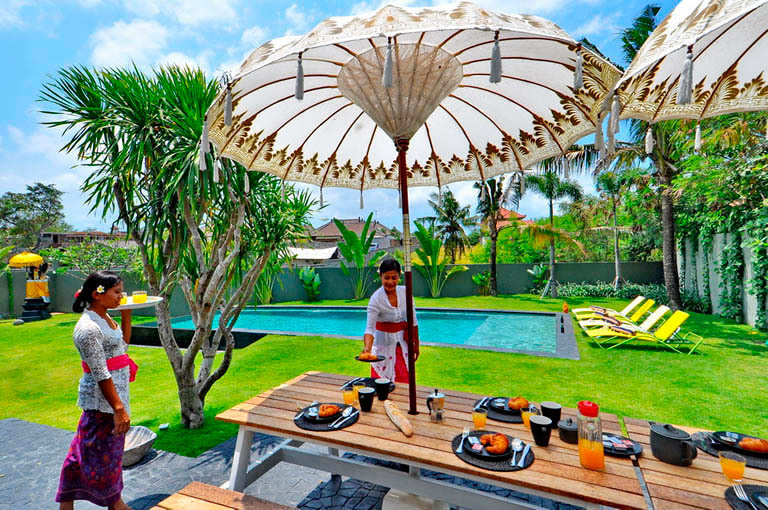 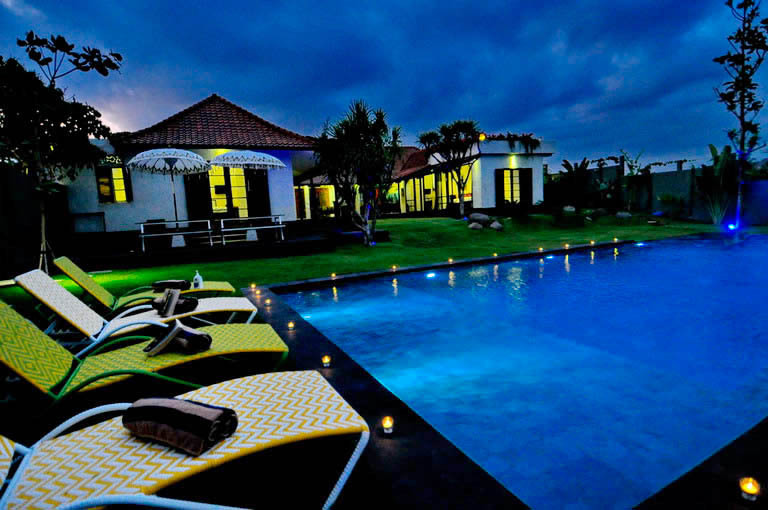 The villa Di Paradiso in Canggu, Bali, Indonesia is a harmonious blend of rustic and modern and luxurious equipment. 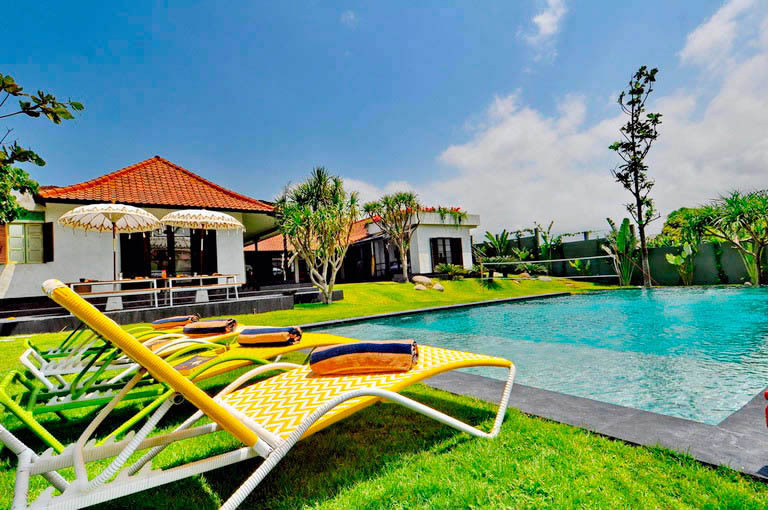 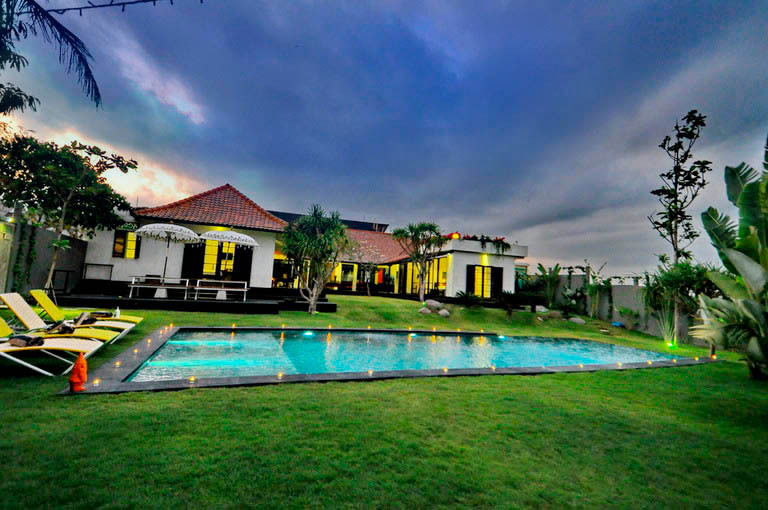 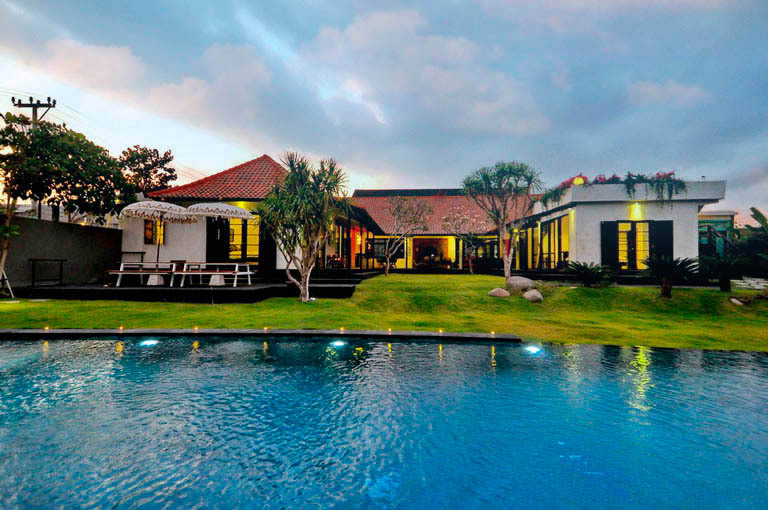 The villa is located near by the famous beach of Batu Bolong and is surrounded by beautiful rice fields and the center of Seminyak is only 20 minutes away by car. 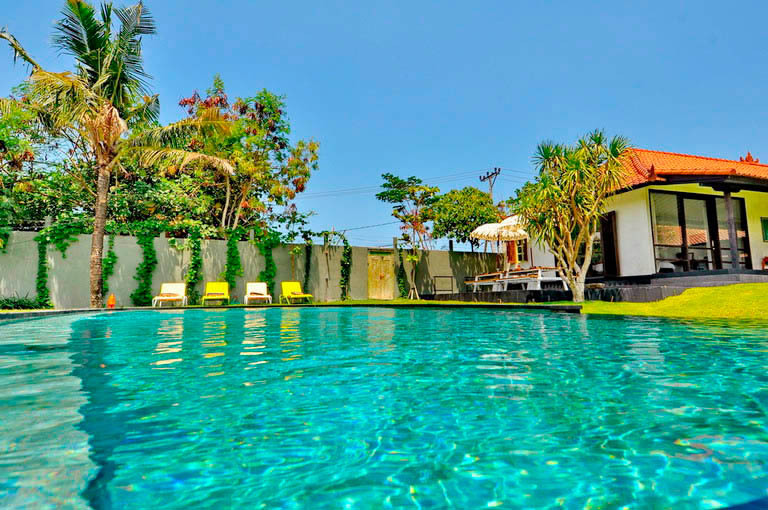 This vacation home is perfect for families and groups of friends looking for a quiet four-bedrooms villa with a possibility of a fifth room for a child with two single beds and four bathrooms and 1 guest toilet. 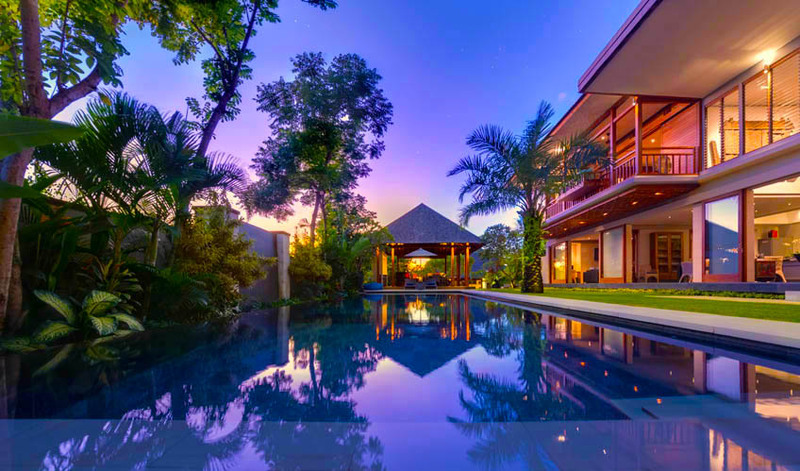 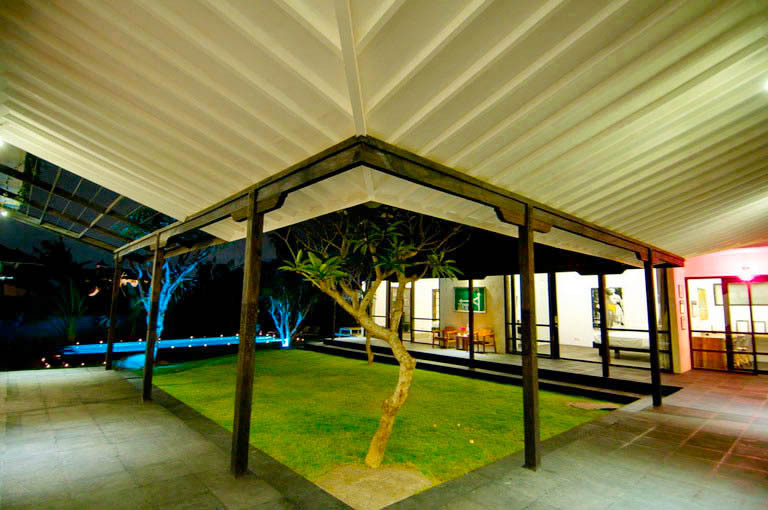 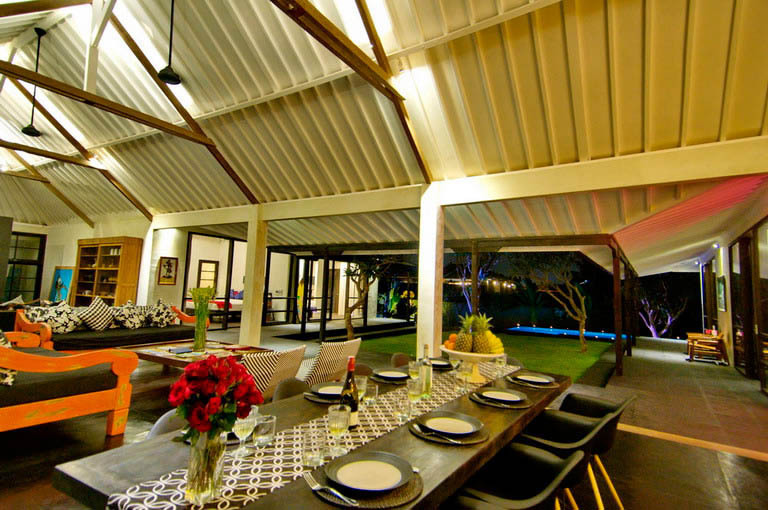 It also has a large tropical garden, a wonderful lawn and a large upscale pool spread over 1200mÂ². 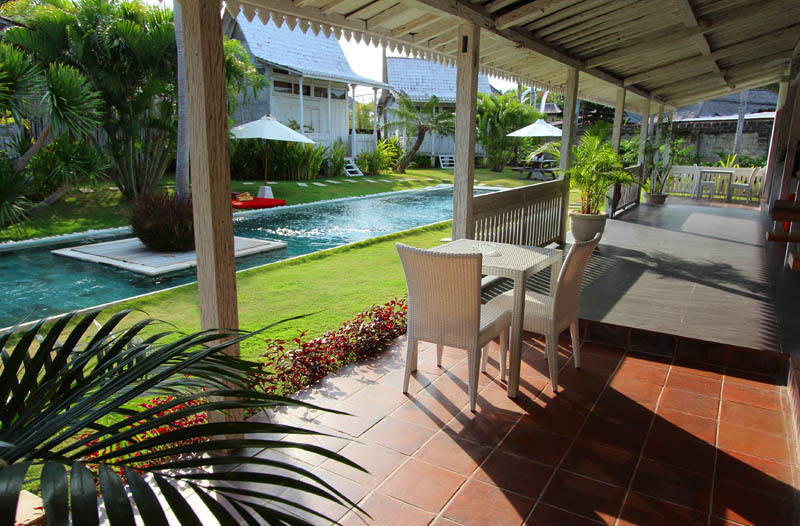 The villa is close to all restaurants, bars, shops and 2 km away from Echo Beach. 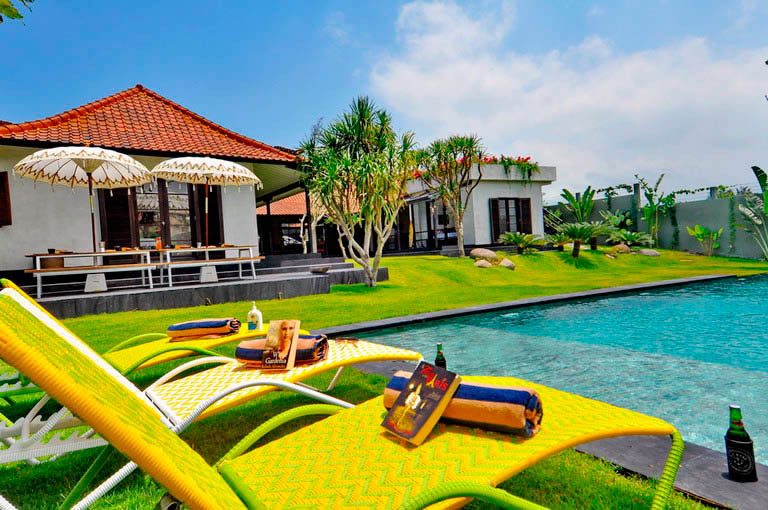 A large sunny tropical garden wait for you at the Villa, with a wonderful infinity pool in natural stone, perfect for a swim. 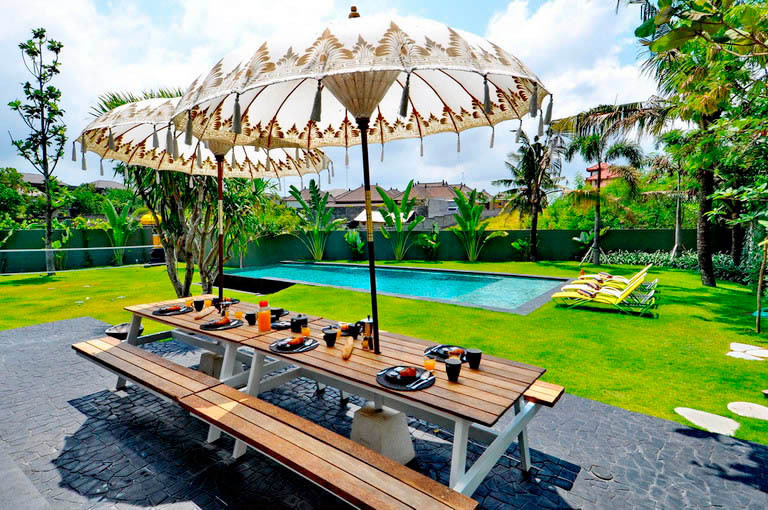 You can enjoy the beautiful lawn or take a sun bath or enjoy a delicious brunch, comfortably installed at the picnic table in a protected timber. 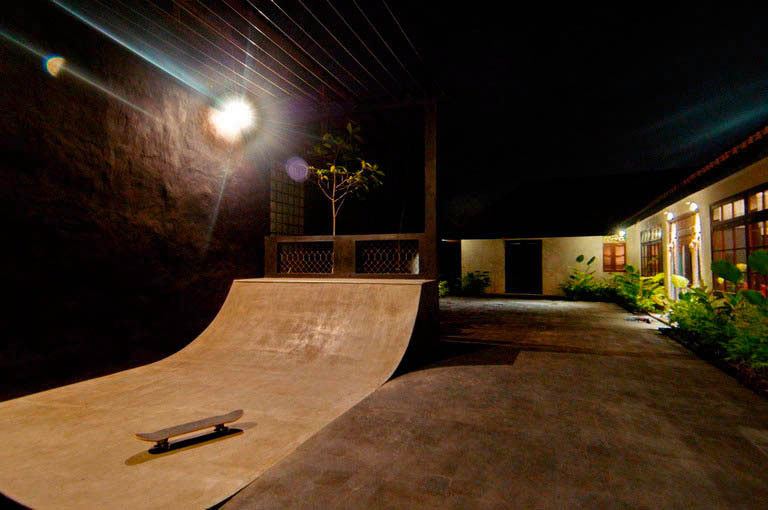 A skateboard ramp is located at the entrance of the property; entertainment guarantee for the youngest! 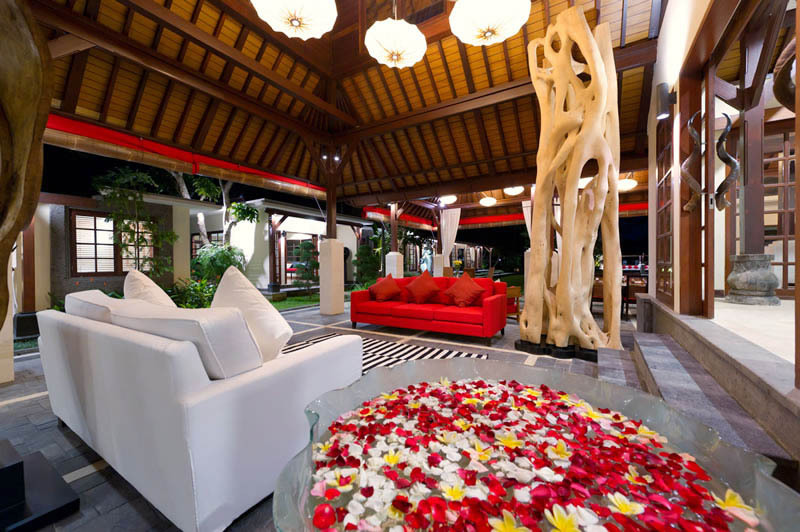 The Villa has a spacious tropical pavilion open to the outside housing the living room, with a nice combination of original elements and modernity. 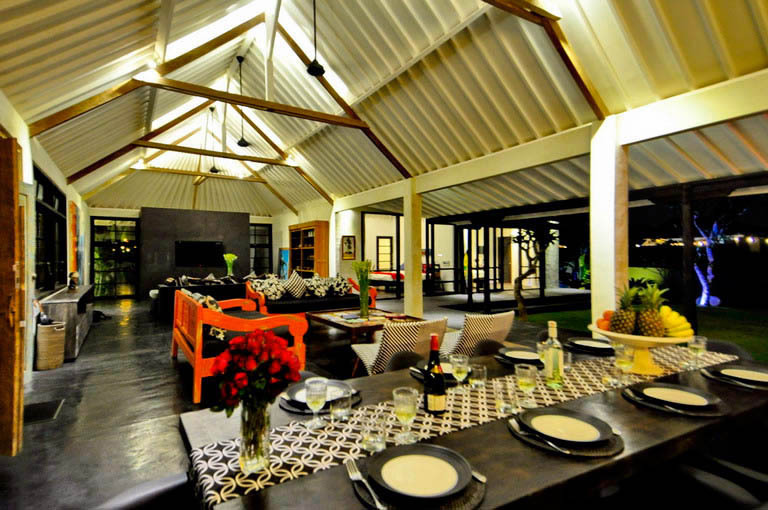 You can sit comfortably on the couch and read a book or watch a movie on the TV, while the large wooden table is perfect to enjoy a nice dinner. 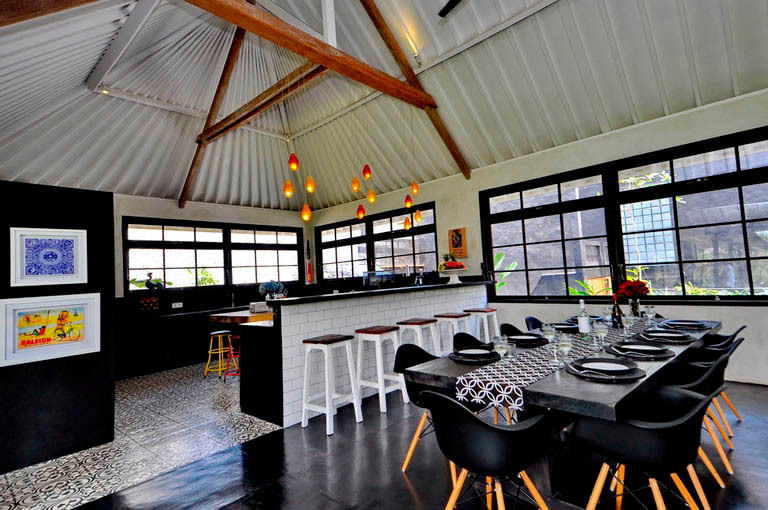 The open kitchen is fully equipped, including with an espresso coffee machine and bar with stools, making it another pleasant and friendly place to relax. 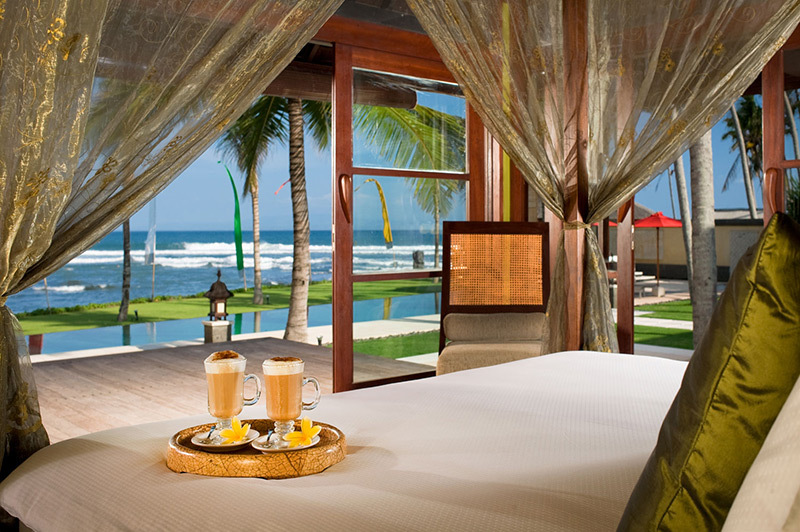 It has a corner office with a printer. 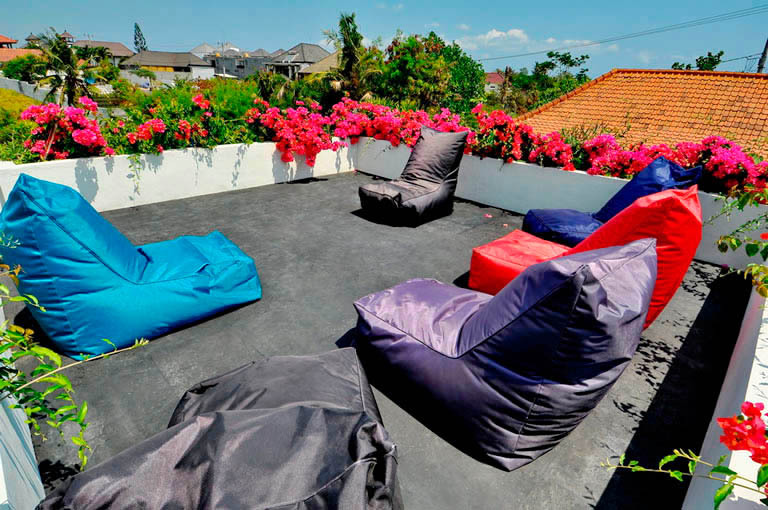 Upstairs on the roof, there is a relaxation area with a beautiful view on the rice fields. 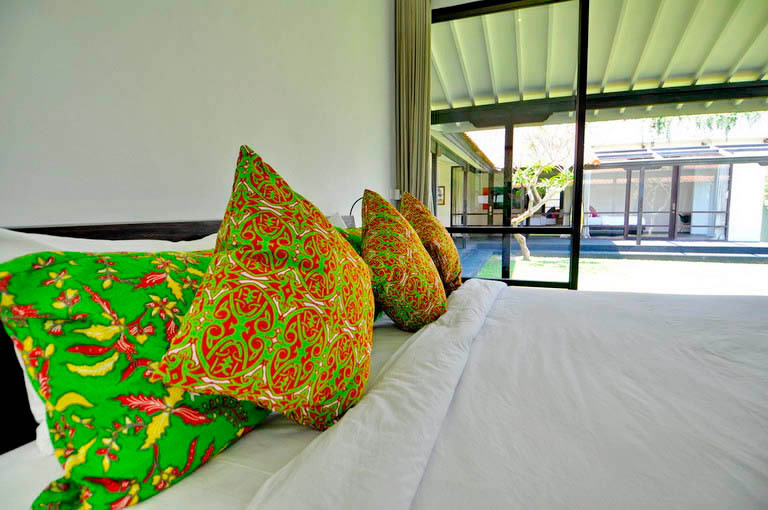 The master bedroom is spacious and boasts a garden view. 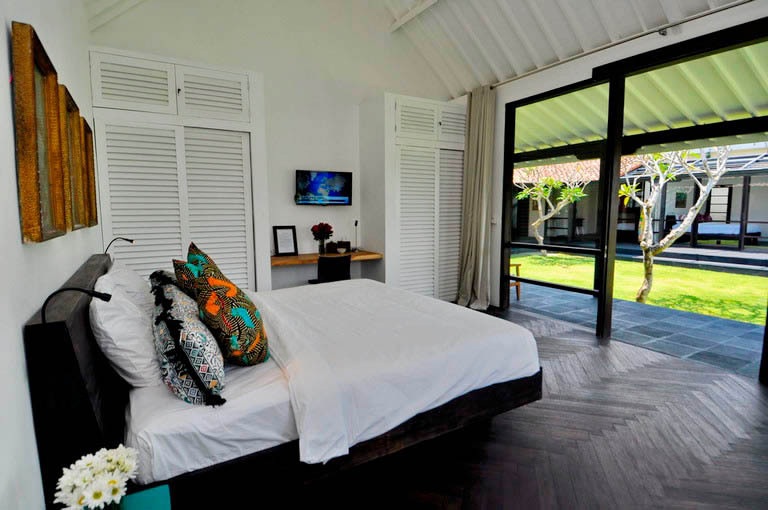 It is equipped with a comfortable king size bed, installed in front of a TV. 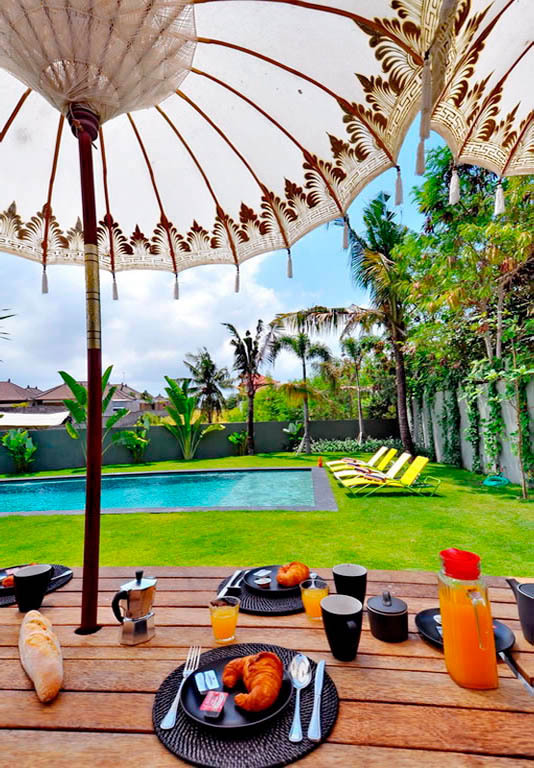 This room is particularly adapted for families with children or group of friends, since it shares its luxurious bathroom with bath with another bedroom, which allows the communication to be really easy. 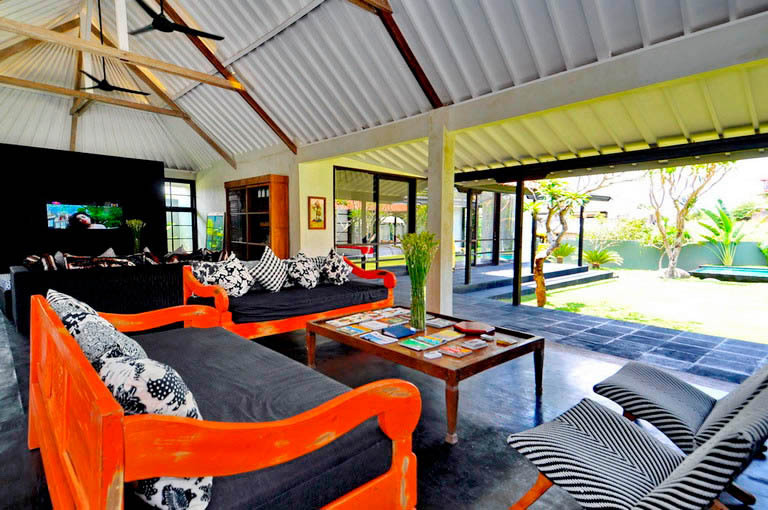 The other three bedrooms are spacious and luxurious, with sliding glass doors overlooking the garden, large king size beds and TV. 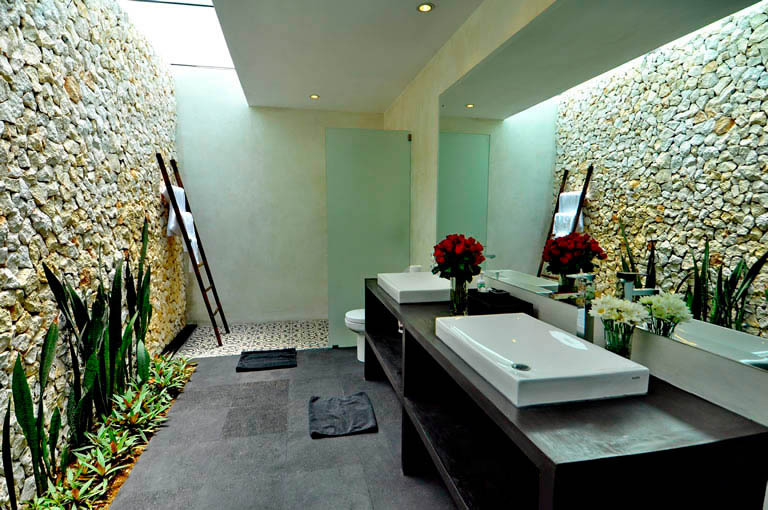 The cabinets contain a safe and en-suite bathrooms are decorated with natural stone and green plants. 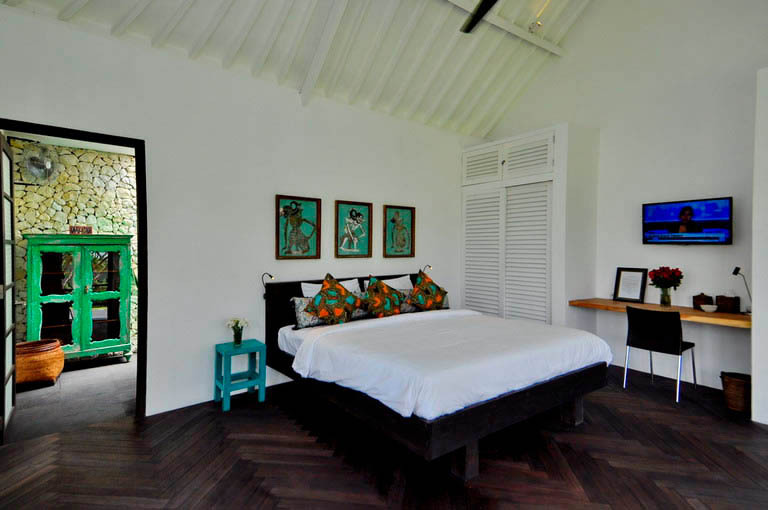 All the rooms have showers and double sinks.